This weekend, let's make dad feel special. To show your love, how about preparing him a feast fit for a king. Start with delicious Chicken Pesto skewers! The best way to dad's heart is through his stomach. 2. Grab a barbeque stick and skewer the sweet corn, followed by the red bell pepper, zucchini, red onion, cherry tomato and chicken fillet. Repeat until there's only space left for holding onto the stick. 3. Using a blender, mix the basil leaves, garlic and pine nuts. Pour the olive oil gradually while blending, then season to taste. 4. In a bowl, marinade the chicken skewer with the prepared pesto for about 15 to 30 minutes. Set aside. 5. 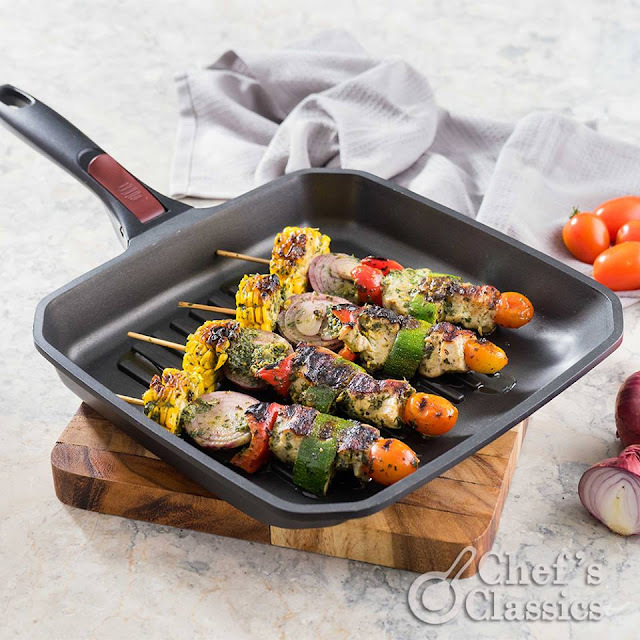 Heat the Chef's Classics Caper Grill Pan, then grill the chicken pesto Skewer.